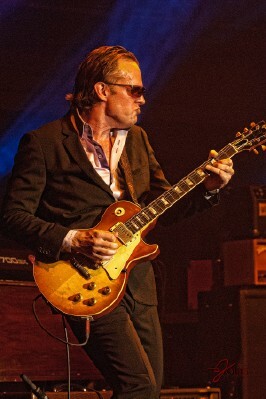 As Joe Bonamassa continues to grow his reputation as one of the world's greatest guitar players, he is also using his star power to be an advocate for music education. His non-profit foundation, Keeping The Blues Alive (KTBA), donates to music education programs, supports scholarships and promotes blues music by partnering with sponsors such as Guitar Center, Ernie Ball, and Joe's label, J&R Adventures. In an ongoing effort to raise additional funding, Bonamassa has put together two exclusive events. The first, dubbed "Muddy Wolf"--a tribute to the music of Muddy Waters and Howlin' Wolf, saw Bonamassa and a hand-selected ensemble of master musicians perform before a sold out crowd of 9700 people. The benefit concert held at RedRocks Amphitheater raised $45,000. It was filmed for PBS and Palladia, too. Air dates to be announced. DVD set to release March 2015. The second gathering, the Keeping The Blues Alive at Sea cruise sails from Miami, FL to Nassau, Bahamas, February 17 - 21, 2015. As of late, limited cabin space is available. You can check here for complete details. Who wouldn't want to participate in this floating music festival? The lineup includes such passionate players as Joe Bonamassa, John Hiatt, Robben Ford, Robert Randolph and The Family Band, Ana Popovic, Joanne Shaw Taylor, Rock Candy Funk Party, Bernie Marsden, SIMO, Ryan McGarvey, and Brandon Santini. What's more? 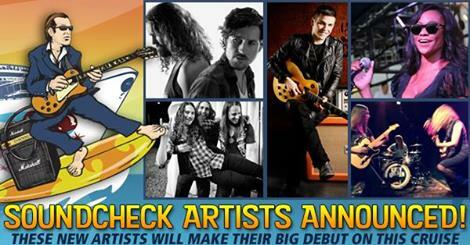 Many emerging artists signed up for Joe Bonamassa's Soundcheck Stage for the opportunity to play. Today, the official announcement was made: "The winners have been chosen, and we're happy to announce that Black Pistol Fire, Steve Costello, Katy Guillen and The Girls, Radio Moscow, and Tasha Taylor are officially performing!" The top five winners are guaranteed to play two live sets. Still--they have another chance of a lifetime: to play the Main Stage. Discover new blues music and be a part of Keeping The Blues Alive, by clicking the link below. Deb's Music Stop would like to congratulate all five winners. Label: J & R Adventures, Inc.
"Blues Rock Titan" (Guitar World), "The New King Of Blues" (Guitarist Magazine), and "the hardest working man in the business", describe Joe Bonamassa, for good reason. Bonamassa's career began onstage opening for B.B. King in 1989, when he was only 12 years old. The bluesman gained valuable experience by sharing the stage with other veteran musicians decades his senior. 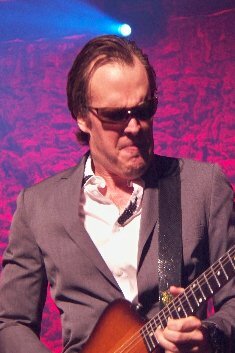 By 17, Bonamassa recorded an album with the American blues rock band, Bloodline, in advance of launching his solo career. Such milestones cast a solid foundation for an enduring presence in today's music scene. Accomplishments highlighted in the artist's bio reflect a mere tip of the "blues" iceberg, though. Averaging 200 shows per year, Bonamassa tours the world, Spring and Fall, thrilling thousands of music lovers with his unique brand of intoxicating blues-rock. 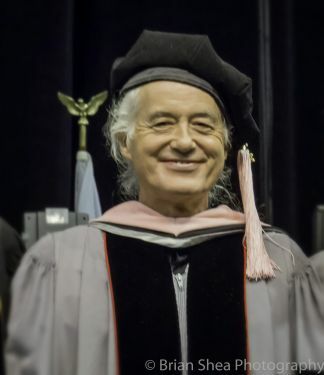 He has performed and collaborated with (or appeared on) a literal list of Who's Who in the music community (Eric Clapton, Johnny Winters, Jimmy Barnes, Jon Lord, Ian Anderson, John Hiatt, Paul Rodgers, Black Country Communion, Rock Candy Funk Party, to name but a few). He has twelve #1 Billboard Blues Albums (more than any other artist) and received his first Grammy nomination in 2013 for his collaboration with Beth Hart on the duo's sophomore album Seesaw. Bonamassa's 2013 solo acoustic project An Acoustic Evening at the Vienna Opera House was nominated by the Blues Music Awards for Best DVD and his 2009 DVD Live From The Royal Albert Hall recently received RIAA Platinum Certification. Through the years, Bonamassa has given back to his fans by signing memorabilia and posing for photos. He truly wants to thank his fans for their loyalty and dedication. Because of their unrelenting enthusiasm on social media, the guitarist's reputation has grown from thousands to 2.2 million Facebook "Likes". As a devout fan, I can attest to the lengths which Bona-fans will go to display their unwavering support. They act like one big, happy family, stretching arms to all corners of the globe. THE MATS MEET AGAIN AT BOSTON CALLING MUSIC FEST!!! 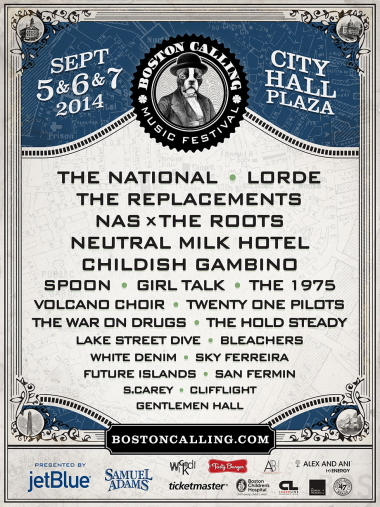 PRESS RELEASE: Boston Calling returns with a heavy hitting lineup this September 5, 6 and 7, 2014 at the city's historic City Hall Plaza [One City Hall Square, Boston, Massachusetts]. Produced by Crash Line Productions, Boston Calling will once again deliver 22 live performances this September. A limited number of tickets are still available for purchase at www.bostoncalling.com. PERFORMANCE HIGHLIGHTS: As with the festival's three previous editions, September's lineup was co-curated by Aaron Dessner, the acclaimed songwriter and multi-instrumentalist of The National. After playing to a sold out crowd at the inaugural Boston Calling in May 2013, The National is back to headline and joining them at the top of the bill are 2014 Grammy winner and global vocal sensation, Lorde, The Replacements, back for their first Boston show since 1991, Nas, celebrating the 20th Anniversary of his debut album Illmatic and collaborating with The Roots, who will also perform their own set, and indie rock cult favorites Neutral Milk Hotel. The water pouring down on the crowd at Fort Adams, only seemed to awaken the spirit of light among the people waiting to see Gregory Porter. 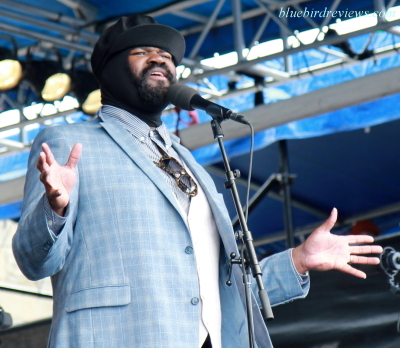 I came out early to set up and a man in the crowd told me he was waiting to see Gregory Porter, because, "He is the best vocalist - maybe in the world right now." I knew what he meant, and so did many of the people around us, also waiting in the rain. The Grammy winner has a long history of changing the lives of audiences with his velvet soul to jazz voice. The most striking thing about him is his humility and ability to reach people with honest words and meaningful rhythms. Yes, meaningful rhythms. It seems he and his band are able to write songs that use the instrumentation to speak, as well as the words. Photos from the 2014 Newport Jazz Fest! 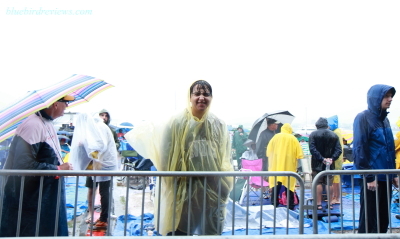 The Newport Jazz Festival Celebrated 60 years of historic music. Reviews of multiple artists will be posted on the website soon. Read more: Photos from the 2014 Newport Jazz Fest! The Newport Jazz Festival Celebrates 60 Years!